To reinforce potato production and boost potato consumption in Vietnam 3 companies and 1 institution with the aid of the Dutch government, joined forces to vitalise the Vietnamese potato sector as part of the project “Growing out of poverty with potato”. 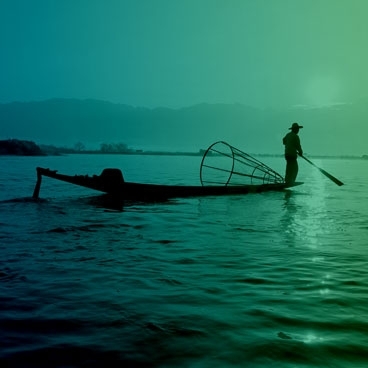 Vietnam is one of the most rapidly developing economies in Southeast Asia, which culminated into the status of middle-income country in 2009. The associated urbanisation and transformation of agricultural land into industry and housing has put pressure on food provision. Despite the fact that there is currently no food shortage in Vietnam, food security is high on the national agenda and the country is essentially depending on rice- 94% of total arable land is rice production. There is ample potential for the development of a professional potato sector in Vietnam. The tuber offers abundant opportunities to improve food security. 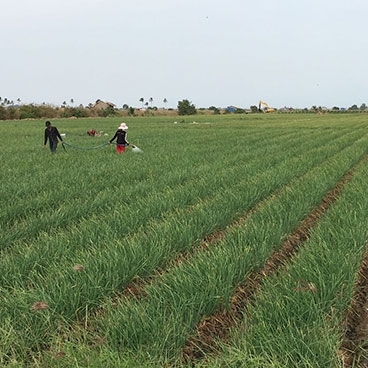 Besides, it provides an addition income for farmers due to cultivation period in the rice off-season in North-Vietnam and high yield potential. Although potato consumption is still low, recent trade statistics clearly demonstrate that the Vietnamese potato sector is not able to produce sufficient potatoes to meet this growing domestic demand. From an import level of fresh potatoes of just US$ 1.1 million in 2003, fresh potato imports expand to US$ 44.6 million in 2011 (UN COMTRADE statistics, 2012). The real figure will probably be double as high, as the large majority of imported potatoes are imported through the Chinese-Vietnamese border, and accurate data of this volume is not available. Despite the fact that domestic potato demand is higher than local supply, to date potato has remained a low interest crop to both producers and consumers. The development of a professional potato sector is currently trapped in a vicious circle of low-interest – low quality produce: Most farmers are unaware of the economic potential of potato farming. They lack the knowledge on advanced cultivation techniques and good planting materials. Therewith the productivity is low and the disease pressure is high. As a consequence the market, both professional processing industry and end-consumers are met with an inconsistent volume and quality supply. Low yields for farmers and low quality to end-users keep potato in the low interest category. But even despite being of limited interest, a small increase in per capita potato consumption results in steep rise in demand on a national level with a population approaching 90 million. 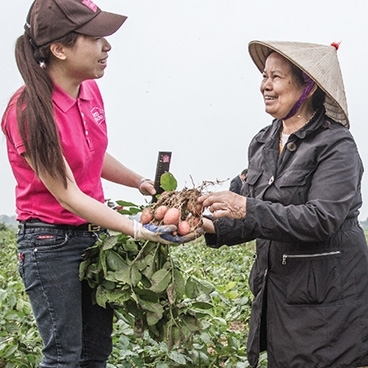 “Growing out of Poverty with potato” is a project of Fresh Studio, PepsiCo Food Vietnam, Agrico and Applied Plant Research-WUR and the Ministry of Foreign Affairs of the Netherlands within the Facility for Sustainable Entrepreneurship and Food Security (FDOV). To actually realise potato as an important crop for food security, pro-poor development and dietary improvements a holistic approach will be essential in which both the table and processing potato sector will be vitalised simultaneously. The processing potato sourcing is an important economic driver for sector development in terms of economy of scale, continuity and purchase certainty of the production. On the other hand the processing potato sector will benefit from a thriving table potato sector. A larger potato sector will in general result in higher quality production and more interest of farmers to start potato cultivation. Better quality production will result in better consumer appreciation and higher potato consumption levels. Meeting increasing demand with domestic production by realising larger volumes of better quality and prolonged shelf-life/storability for both processing and table potatoes. Therewith potato consumption contributes effectively to the national food security program of the Vietnam government; a sector of importance to be able to provide a staple alternative to rice. Improved livelihoods through better economic inclusion of the poorest farmer communities through improved and stable income levels resulting from potato cultivation with better quality and higher yields. Improved nutrition of (poor farmer) households; increased table potato consumption to decrease micronutrient deficiency in particular iron in order to diminish anaemia. Increased potato consumption beyond chips and French fries, through increased awareness of the versatility and nutrition of table potato. To introduce table potato as a nutritious alternative to rice. Adoption of new high quality Dutch cultivars in the Vietnam diet: table potatoes that are both different in external appearance and preparation qualities, ones that are more trusted and preferred than imported potatoes. Environmental sustainability: reduce environment pressure and enlarge productivity in terms of both caloric as well as nutritional value per m2.